Bur Dubai district has also got a smart fine dining Korean restaurant within its parameter that serves authentic royal Korean food in the lash settings of Royal Ascot Hotel. This Korean restaurant is known as Dae Jung Kum and it offers the most labour intensive fare of the world, to give its guests a royal dining experience. This majestically harmonised and well balanced food is served to the guests in a luxuriously decorated dining hall that has a warm and extremely cosy environment, where the immaculate service of the staff perfectly complements the decor and the imperial food of this restaurant. Thus, making it an unforgettable experience for the ones, who have never tried authentic Korean food ever before. Dae Jung Kum is well-known for producing highly luscious royal Korean food that was prepared in the royal court of Korea. This special cuisine takes a lot of time and hard work in getting ready therefore it is termed as one of the most intense fares in the entire globe. Some lip smacking varieties of this bistro are banchan (a side dish) that comes with a soup, kimchi-th fermented and steamed rice. Alcoholic beverages like soju and majuang can also be relished with this food at Dae Jung Kum. Apart from this ginseng tea is also on the menu of this restaurant. Smoking is permitted in this eating place therefore smokers would not need to worry about going anywhere else. To see the menu of Dae Jung Kum, click here! This restaurant opens daily from noon till 3:00 pm for lunch and 6:30 pm to 11:30 pm for dinner. Royal Ascot Hotel, 3 C Street - Dubai - United Arab Emirates. Al Fahidi Metro Station 1 is 700 meters walking journey from Dae Jung Kum restaurant in Royal Ascot Hotel, which can be completed in about 9 minutes, if a person heads in the southwest direction on Al Mankhool Road/D 90 towards Khalid Bin Al Waleed Road/D 79, after getting out of this metro station and then turn right onto Khalid Bin Al Waleed Road/D 79 before making a left turn onto 26th Street. This will lead the pedestrian to another turn that goes on the right side onto 3 C Street, from where destination is not too far and can be easily located on the right side after covering some distance. Rolla - Dubai bus stop is 400 meters far from Dae Jung Kum restaurant. This makes it 5 minutes walking journey, if a bus user heads east on Kalid Bin Al Waleed Road/D 79 towards 26th Street from this bus station and then turns right onto 26th Street. 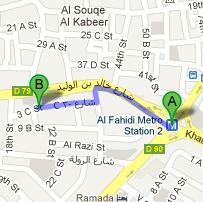 Afterwards make a right turn onto 3 C Street in order to get to the destination, located on the right side. To get to Rolla - Dubai bus stop you can use any of these bus numbers 21, 29, 33, 42, 44, 61, 61D, 66, 67, C1, C5, C7, C18, C19, X23 and 83. Checkout map for directions.